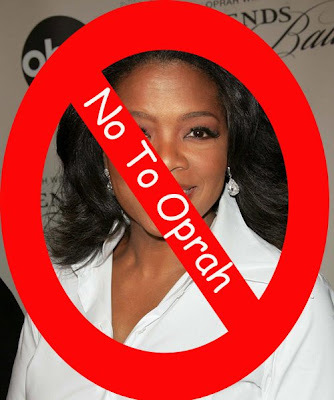 The Fresh Music Page: SAY NO TO OPRAH ON TWITTER! SAY NO TO OPRAH ON TWITTER! This is not music related but it is something dear to me. Keeping Oprah off of Twitter.com. No I can't physically keep Oprah off of twitter but this is to stop the impact of Oprah. Don't follow Oprah can be done. I will not follow Oprah! I don't want Oprah and her middle-aged, middle-class, middle of america people following me either! This is not a fight against the middle because some of the middle is pretty damn awesome but not the ones that watch Oprah. If my mom joins twitter, I am blaming Oprah. 1. Oprah ruined her theme song (She once tried to sing it). 2. Oprah ruined blackplanet (she once had the CEO on her show). Please feel free to add your things that Oprah has ruined. Don't let Oprah ruin twitter!